Rabbi Eliyahu Maksumov is part of Torat Emet, EMET’s popular higher-level learning division for boys, and oversees Emet’s Shabbat Minyan with Rabbi Dovid Delman. Rabbi Maksumov was born in Uzbekistan and moved to America as a child. While attending public school, he developed an interest in becoming more religious. Over the years, he strengthened his commitment to Torah observance, and developed a strong love of learning and teaching Torah. 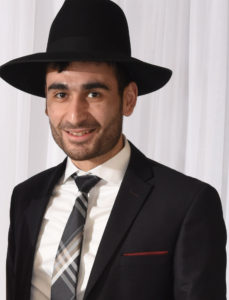 Rabbi Maksumov has a deep passion for teaching Torah and helping people become closer to Hashem. He spends countless hours sifting through resources to find the most powerful, enjoyable, and impactful information, to share with his students, to instill in them a desire to grow. After graduating from Mesivta Tiferes Jerusalem High School, Rabbi Maksumov attended Yeshiva Zichron Aryeh and Yeshiva Derech Chaim. He has worked with Chazaq, Time Out for Values, and currently teaches for EMET on college campuses and other EMET programs throughout the week.